Toronto scientists uncovered how viral remnants helped shape control of our genes. If genes were lights on a string of DNA, the genome would appear as an endless flicker, as thousands of genes come on and off at any given time. Tim Hughes, a Professor at the University of Toronto's Donnelly Centre, is set on figuring out the rules behind this tightly orchestrated light-show, because when it fails, disease can occur. 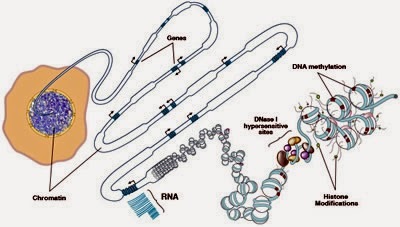 Genes are switched on or off by proteins called transcription factors. These proteins bind to precise sites on the DNA that serve as guideposts, telling transcription factors that their target genes are nearby. In their latest paper, published in Nature Biotechnology, Hughes and his team did the first systematic study of the largest group of human transcription factors, called C2H2-ZF. Despite their important roles in development and disease, these proteins have been largely unexplored because they posed a formidable challenge for researchers. C2H2-ZF transcription factors count over 700 proteins - around three per cent of all human genes! To make matters more complicated, most human C2H2-ZF proteins are very different from those in other organisms, like those in mice. This means that scientists could not apply insights gained from animal studies to human C2H2-ZFs. Hughes' team found something remarkable: the reason C2H2-ZFs are so abundant and diverse - which makes them difficult to study - is that many of them evolved to defend our ancestral genome from damage caused by the notorious "selfish DNA." Selfish DNA are bits of parasitic DNA whose only purpose is to multiply, a kind of virus for our genome. They seize a cell's resources to make copies of themselves, which they insert randomly across the genome - causing harmful mutations along the way. Almost half the human genome is made of selfish DNA, which probably came from ancient retro-viruses which, similar to modern counterparts, inserted their DNA into the host's genome. When this happens in an egg or sperm, the viral DNA gets passed on to the next generation, and the selfish DNA is then known as endogenous retro-elements (EREs). Evolutionary biologists believe that selfish DNA was instrumental in making genomes bigger, giving natural selection additional DNA material to tinker with. But Hughes' data suggest that EREs took centre stage in an evolutionary arms race, and that this change spawned C2H2-ZFs, a new group of proteins. It is an enthralling tale of "conquer and enslave," one that stretches from before mammals existed to the present day. Hughes says that C2H2-ZFs initially evolved to switch off EREs. As new EREs invaded the genome of our lizard-like ancestor, new C2H2-ZFs arose to prevent them from disrupting gene function. This would explain how the C2H2-ZF came to be so abundant but also why they are so diverse among different organisms. "What I think was not appreciated until this study is that retro-elements are really a driving force in the evolution of transcription factors themselves. All mammals have a whole bunch of custom transcription factors that came about to silence the EREs," says Hughes, who is also a Professor in U of T's Department of Molecular Genetics and a Senior Fellow of the Canadian Institute for Advanced Research. "But the EREs and these new transcription factors are different even for different vertebrates." These EREs are now harmless because they are millions of years old. Over time they accumulated mutations, which pepper the genome at a constant rate, and, as a result, lost their ability to multiply and move around. The C2H2-ZFs, on the other hand, took on new jobs. C2H2-ZF proteins began using the EREs scattered across the genome as DNA docking sites, from which they could take control of nearby genes. The conquered EREs were finally enslaved. Hughes describes a neat example of this process. One C2H2-ZF family member, a transcription factor called ZNF189 evolved to silence an ancient retro-element, known as LINE L2, which is a staggering 100 million years old. L2 is now inactive but ZNF189 still binds to it because it uses L2 remnants to reach other genes. Relics of L2 sequences happen to be near genes that drive brain and heart development. And so ZNF189 could take on a new role in shaping these organs, an arrangement preserved by natural selection because it was beneficial to the embryo. ZFN189 likely puts "breaks" on the "brain genes", similar to its ancient role with L2. But in heart cells, it may actually turn genes on because it misses the part that makes the "off switch." This story is a beautiful example of just how malleable genomes are at the hands of evolution. Researchers supported by the National Institutes of Health Common Fund's Roadmap Epigenomics Program have mapped the epigenomes of more than 100 types of cells and tissues, providing new insight into which parts of the genome are used to make a particular type of cell. The data, available to the biomedical research community, can be found at the National Center for Biotechnology Information website. Reference epigenomes are available for more than 100 cell and tissue types. Credit: Image courtesy of Nature and Roadmap Epigenomics Consortium. "This represents a major advance in the ongoing effort to understand how the 3 billion letters of an individual's DNA instruction book are able to instruct vastly different molecular activities, depending on the cellular context," said NIH Director Francis Collins, M.D., Ph.D.
"This outpouring of data-rich publications, produced by a remarkable team of creative scientists, provides powerful momentum for the rapidly growing field of epigenomics." Researchers from the NIH Common Fund's Roadmap Epigenomics Program published a description of the epigenome maps in the journal Nature. More than 20 additional papers, published in Nature and Nature-associated journals, show how these maps can be used to study human biology. "What the Roadmap Epigenomics Program has delivered is a way to look at the human genome in its living, breathing nature from cell type to cell type," said Manolis Kellis, Ph.D., professor of computer science at the Massachusetts Institute of Technology, Cambridge, and senior author of the paper. 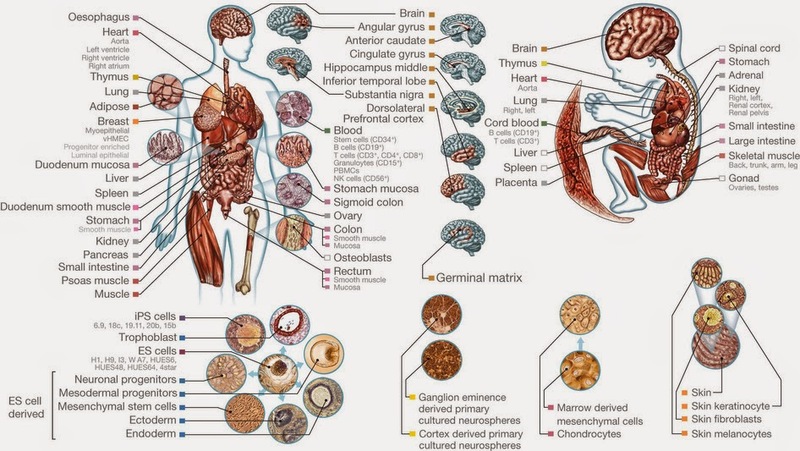 Almost all human cells have identical genomes that contain instructions on how to make the many different cells and tissues in the body. During the development of different types of cells, regulatory proteins turn genes on and off and, in doing so, establish a layer of chemical signatures that make up the epigenome of each cell. In the Roadmap Epigenomics Program, researchers compared these epigenomic signatures and established their differences across a variety of cell types. The resulting information can help us understand how changes to the genome and epigenome can lead to conditions such as Alzheimer's disease, cancer, asthma, and foetal growth abnormalities. to a DNA molecule directly (DNA methylation). Researchers can now take data from different cell types and directly compare them. "Today, sequencing the human genome can be done rapidly and cheaply, but interpreting the genome remains a challenge," said Bing Ren, Ph.D., professor of cellular and molecular medicine at the University of California, San Diego, and co-author of the Nature paper and several of the associated papers. "These 111 reference epigenome maps are essentially a vocabulary book that helps us decipher each DNA segment in distinct cell and tissue types. These maps are like snapshots of the human genome in action." "This is the most comprehensive catalogue of epigenomic data from primary human cells and tissues to date," said Lisa Helbling Chadwick, Ph.D., project team leader and a program director at the National Institute of Environmental Health Sciences (NIEHS), part of NIH. "This coordinated effort, along with uniform data processing, makes it much easier for researchers to make direct comparisons across the entire data set." "Researchers from the 88 projects supported by the program, including those from this recent series of papers, have propelled the development of new epigenomic technologies," said John Satterlee, Ph.D., co-coordinator of the Roadmap Epigenomics Program, and program director at the National Institute on Drug Abuse (NIDA), part of NIH. Satterlee added that the work of this program has served as a foundation for continued exploration of the human epigenome through the International Human Epigenome Consortium. 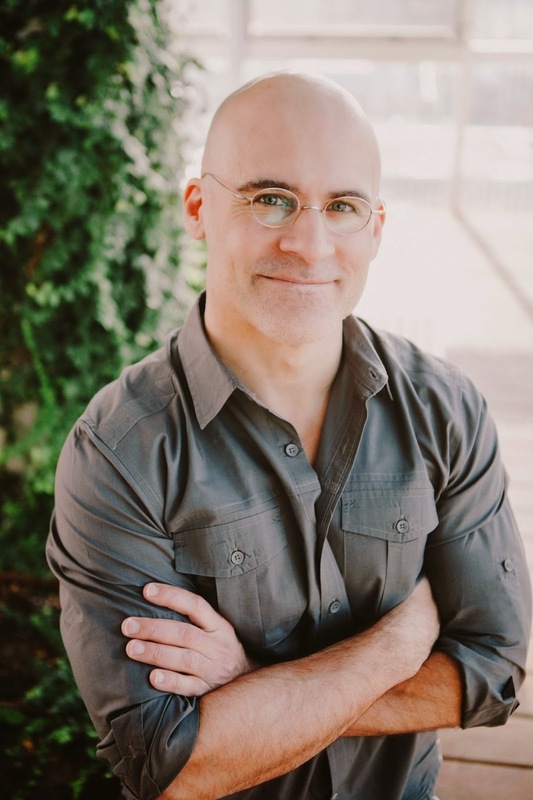 "With this increased understanding of the full epigenome, and the datasets available to the entire scientific community, the NIH Common Fund is striving to catalyse future research, to aid the understanding of how epigenomics plays a role in human diseases, with the expectation that further studies will identify early indications of disease and targets for therapeutics," said James Anderson, M.D., Ph.D., director of NIH Division of Program Coordination, Planning, and Strategic Initiatives that oversees the NIH Common Fund. NIDA, NIEHS, and the National Institute on Deafness and Other Communication Disorders are co-administrators of the NIH Common Fund's Epigenomics Program.